Do you find Arabic geometry as interesting as I do? It fascinates me how a minor change in a repeat pattern can give a whole different look and feel to the resulting effect. The repeats of Moroccan style tiles have an affinity with crochet motifs and I’ve been wondering if I could recreate the effect in crochet for a while. 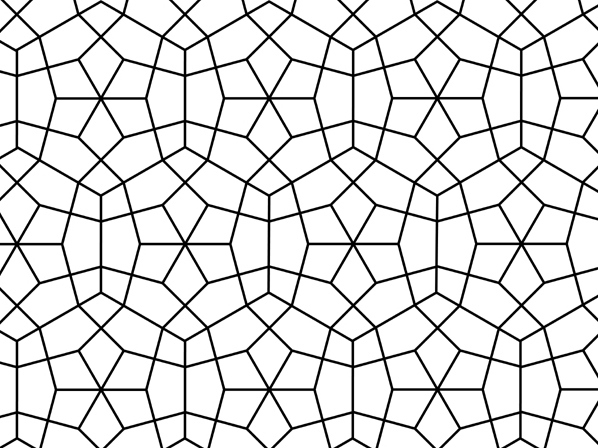 At first glance this pattern looks like overlapping circles but it is actually a fairly simple hexagon repeat. Of course you can use the motifs for anything you like – scarves, blankets etc. I’m thinking of using something variegated as the background for a scarf if I do this design again. Contrasting dk yarn in two colours. I used Debbie Bliss Prima (white) – 150m approx. used including that used for the cushion border – and Rowan Wool Cotton -113m. 1 ball each in white and blue makes approximately 10 motifs with left over white for the border – but you may want more for the border depending on how many rounds you add. A post stitch worked in front of the work so it is only visible on the right side. Yarn over hook twice, insert hook as directed (into a stich several rows below where you are working or about a post of the stitch several rows below). Draw up a loop (4 loops on hook). *Yarn over, draw through 2 loops, repeat from *2 more times to complete the stitch. Note that a post stitch always counts as being worked in the next stitch even though the loops remain unused. The motif is made in the round and uses post stitches. Begin with white and make a magic ring. R1: work 6sc into the ring and draw closed. Join with a sl-st. Fasten off. Do not fasten off blue yarn as we will come back to this later. Join the white yarn into the front loop only (f.l.o) of the next hdc st and ch1. Work round 5 in the f.l.o. R5: *sc in hdc, (3sc) in dc, sc in hdc, fptr about sc post in R1 (use whichever post is most directly below), sk next st (so that both sc sts in R4 remain unworked), repeat from * around, join with a sl-st (36sts in R5). Fasten off white and weave in white ends now if you like, to keep things neat. Pick up the blue yarn from where you left off. Work R6 in the unused sc sts of R4 and the back loops left unworked by R5. Fasten off blue and rejoin white into the first st after a (2sc) group, ch1. When working the fptr in round 9, work the first one into the centre sc of the (3sc) group made in R5 which is angled slightly backwards of where you are. Work the second into the centre sc of the (3sc) group made in R5 which is angled slightly forward of where you are. When you work the next fptrc do the same – there will end up being 2fptr in each sc around. R9: *sc, fptr, 3sc, fptr, sc, (2sc), repeat from * 5 more times, join with a sl-st (54 sts). 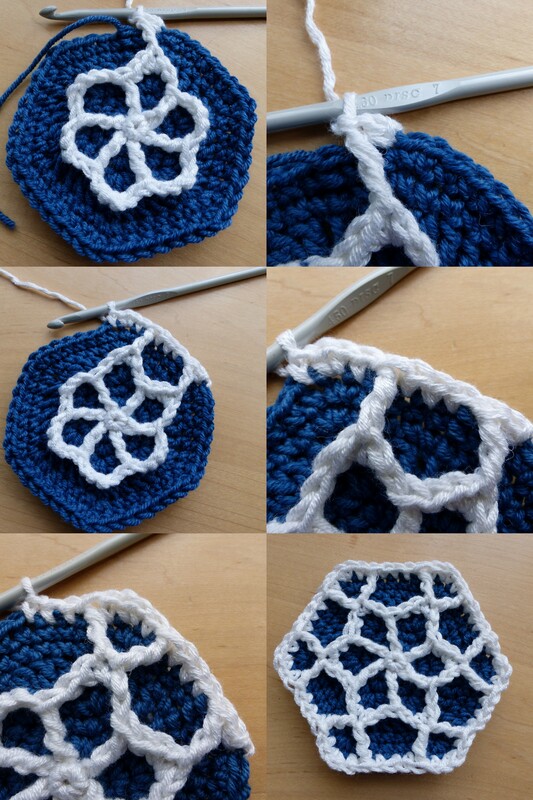 Block your motifs using your preferred method for your yarn choice. Stitch together using your preferred joining technique. I slip stitched my hexagons together on the reverse to give a quilted effect. To make a cushion cover like mine, single crochet around the joined hexagons, working a hdc2tog, dc3tog, hdc2tog into the 7 stitches centred at each inverted corner, to smooth out the edges. Work 2sc into each regular corner as before. Work as many rounds as you like. 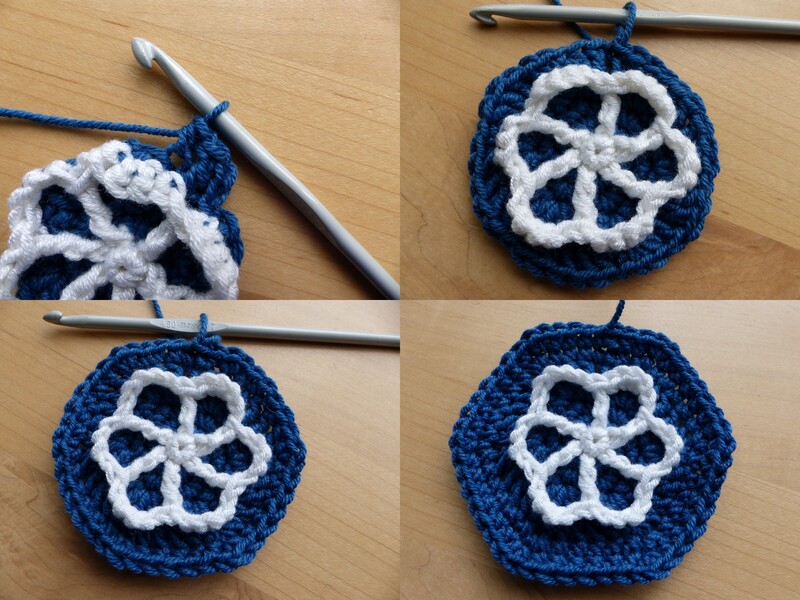 I also added a round of surface crochet in blue around my hexagons, worked in slip stitch over each post of each stitch around. So, what will you make with your motifs? And what colours will you choose for yours? Very interesting! It’s a long time since i’ve seen something so new to me .i’d also make it in white and blue like Azuleros tiles.Bravo ! This is so beautiful I can’t wait to make it. Beautiful and a clever pattern! So beautifull!!! Thanks fot the instructions! Thank you so much for this pattern, I just need to put it on my to-do-list! I can’t wait to get started on this beauty! This is completely beautiful! Thanks so much for sharing the “How to” & pattern. Would love to try it with t-shirt yarn. 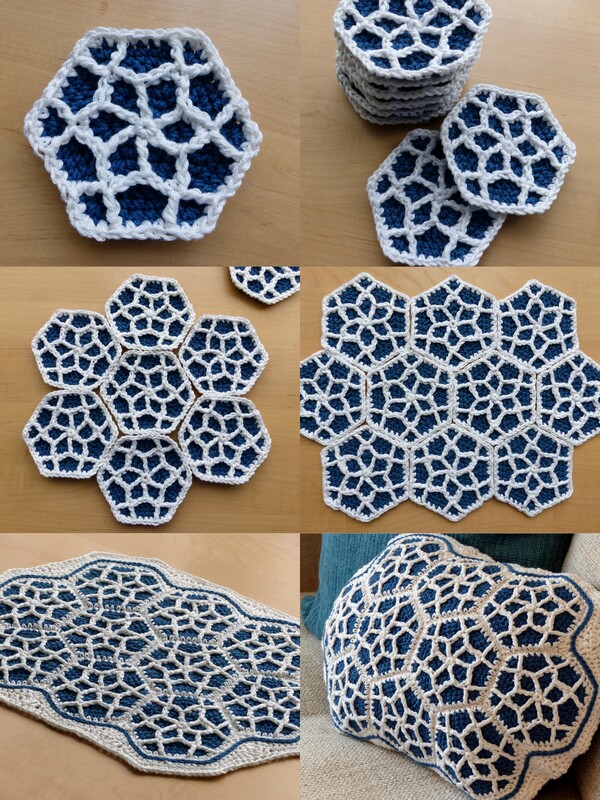 I am planning on stopping short of making the cushion and just sewing the hexagons together and making them placemats for eating at the dinning room table. I am also doing white and a dark blue. 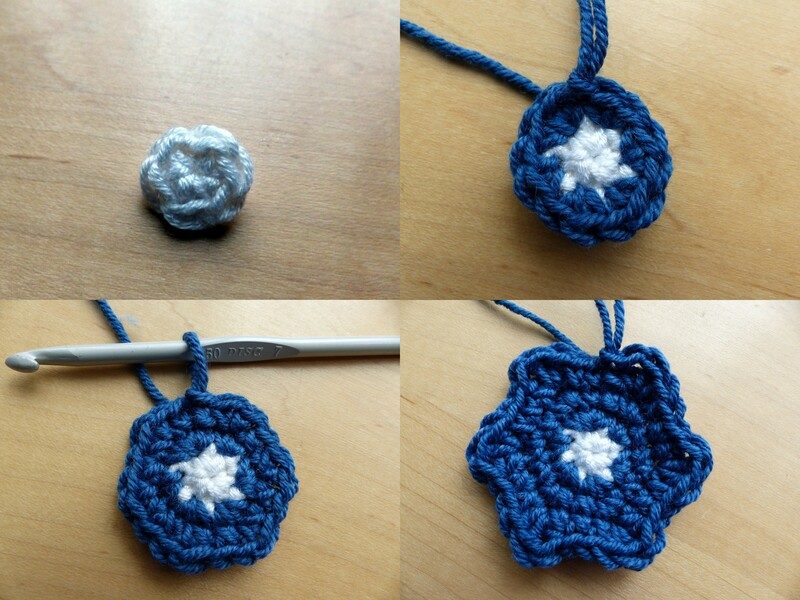 I love this pattern and the instructions are very well done! I have already made 4 hexagons. I have a lot more to do! Thanks for sharing your wonderful creation! Oooh that’s a nice idea! You could do single ones for coasters too :) Glad you are enjoying it! That is the plan! So I am trying to decide how to stitch/sew the hexagons together…. You said you slip stitched them together. Did that leave a bump on the backside? I cant decide if just doing a whip stitch will help it lay flat better since they will be placemats and not cushions :) What do you think? :) Thanks!